BOCA RATON – Last year B.J. Emmons heard the chatter, the deafening noise that accompanies a local legend who fell short of expectations. A former five-star recruit and Alabama ball carrier, Emmons spent fall 2018 living in his mother’s Morganton, N.C. home, far removed from the game and the spotlight it’s given him. He was supposed to be at FAU after a JUCO stop the year prior. Now, although it’s later than anticipated, he’s finally an Owl. The questions of ‘what’s he doing here?’ and ‘isn’t he supposed to be in school?’ that once bombarded Emmons are gone. And he’s thrilled to make up for lost time. He wasn’t always this joyous about the game. Coming into college as ESPN’s top-ranked running back, Emmons envisioned leading the Crimson Tide backfield immediately. But with future NFL Draft prospects Bo Scarbrough, Damien Harris and Josh Jacobs ahead of him, that plan didn’t materialize. Emmons carried the ball only 35 times for 173 yards and a touchdown as a freshman. Emmons then took the JUCO route to search for a bigger role. But he soon missed the discipline and routine he had at ‘Bama. He committed to FAU after a trying year at Hutchinson C.C. The Owls were set to have one of the most dynamic backfields in the Group of 5 with Emmons joining Devin Singletary and Kerrith Whyte. 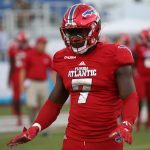 But he didn’t meet FAU’s eligibility requirements, and was forced to put those plans on hold and return home to complete academic requirements online. Emmons worried his career was over every day. When the phone calls from FAU’s coaching staff came less frequently, he thought he would give up. But his mother and grandmother pushed him forward. He was too “frustrated” to watch much college or NFL football, knowing he had the talent to be on the screen rather than watching it. But instead of sulking he decided to make a difference. Emmons returned to his former elementary school and high school to help the youngsters whose shoes he once stood in learn from his unconventional path – the good, the bad and all the bumps in between. In Emmons’ eyes, it would have been “selfish” for him not to share his story with the next generation. He realized the game was bigger than himself and that his actions should reflect that. Kiffin and Emmons are now reunited after two years apart. And despite spending 2018 away from football, Kiffin thinks the 6-0, 230-pound bruising runner looks as gifted as ever. If Emmons still has any rust, he’ll need to shake it off quickly. 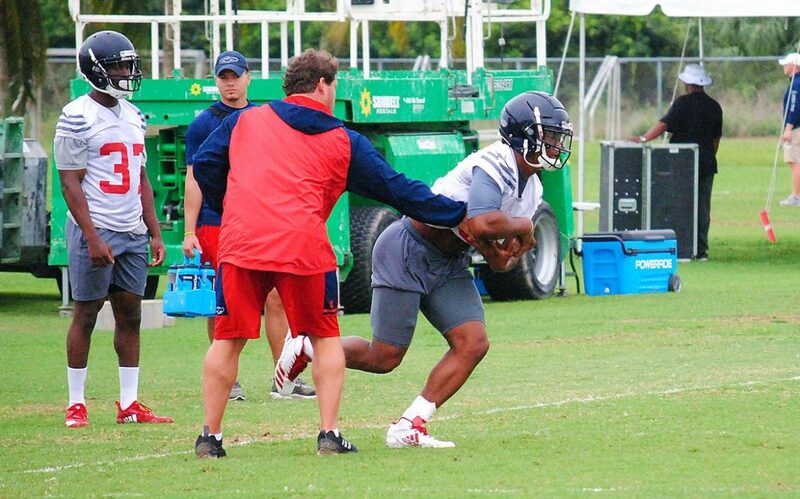 With Singletary and Whyte’s departure, FAU has a combined 11 returning carries from last year, likely thrusting Emmons into the lead role he’s always wanted. But being the top running back at FAU, however, will inevitably lead to comparisons to Singletary, nicknamed “Motor,” who shattered multiple school records en route to an early entry into the 2019 NFL Draft. Emmons admitted a lot of people tell him he can be the next ‘Motor.’ But Emmons is at FAU to blaze a new path, write his own story. Not to follow the footsteps of the star before him.